Visit one of the most iconic landmarks of Paris, the Notre Dame Cathedral. With its distinct gothic architecture and unique stained glass windows, it is truly no wonder that it is the most visited attraction in France. 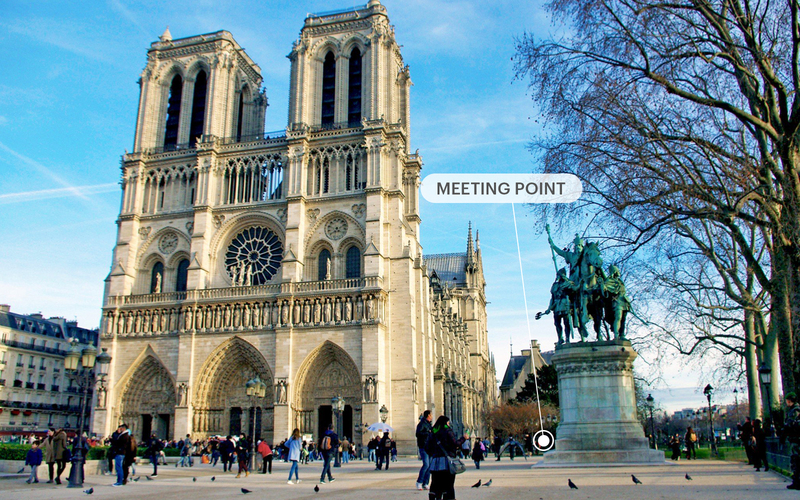 Discover the history, significance and architectural prowess of the Notre Dame, one of Paris' most visited landmarks on this immersive 1-hour tour. Marvel at the cathedral's opulent interiors, magnificent glass windows and the legendary Joan of Arc statue, perfect for photo ops! Obtain exclusive entry into the cathedral and enjoy the convenience of mobile tickets. You will meet your host at the statue of Charlemagne, located on the right-hand side of the forecourt facing Notre Dame Cathedral. You must meet your host first since you will not be able to gain entry into the Cathedral with your mobile voucher. The inside fo the cathedral presents a picture of luxury. The stained glass windows filter vibrant light into the church and the cathedral's massive size coupled with intricate detailing is breathtaking. A statue of the legendary Joan of Arc, can also be seen along with gargoyles, which are linked with Gothic art and architecture, and are set throughout the cathedral. The Notre Dame is considered to be one of the greatest examples of the unique French Gothic architecture. Construction began in 1163, and took over 170 years to fully finish. The treasury of the cathedral houses some of the most important relics in Christianity. These include one of the Holy Nails, that was used for the crucifixion of Jesus Christ. A fragment of the Holy Cross is also safely locked away. From Napoleon's crowning to Victor Hugo's The Hunchback of Notre Dame, the structure has been an integral part of France's history and culture. Your guide won't miss a single detail with great, immersive commentary. Let Paris' architectural brilliance take you on a journey through time and discover the Notre Dame like never before with this tour. We help you discover the best, with the best. Local English guide accompanying you. 1 Hour visit to the Notre Dame Cathedral. The cathedral is open from 9:30 AM to 6 PM from Monday to Friday and 9 AM to 6 PM on Saturdays and Sundays. Your tour will be for one hour and you can choose between 10 AM or 2 PM time slots, depending on the day. Please note that this tour does not include access to the Cathedral's towers. One time visit is a must! A bit disappointed that our tour of the Notre Dame tower was cancelled. I understand it was beyond your control but that was the main reason why I wanted to do the tour as I have been inside many times. You will receive an email confirmation with your Notre Dame Cathedral Guided Tour mobile ticket instantly. No need to print. Just show the ticket on your phone with a valid photo ID at the meeting point.